The deadline for the Create with Connie & Mary challenge was looming, so I hurried into my room to see what I could come up with today. I'm so excited because I won a free subscription to their 2011 Holiday Edition! Isn't that cool?! This was one of those cards that I had an idea for and it just didn't come together. I kept messing with it, but it just wasn't happening. I probably shouldn't even post it, but hey, I did make one! 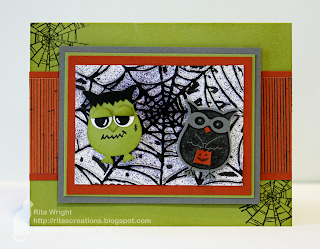 I wanted my little owl critters to look like they were caught up in my spider web, but I don't like the web really. I should have went with my first thought to use leaves. Oh well... Hope everyone survived their Monday! Well I am going to copy your green monster for a treat bag topper for my grandchildren. I am very glad you posted anyway. Thank you. Cute card!! I think the web looks a little spooky!! And the little Franken-owl is adorable!! Thanks for playing the challenge at Create with Connie and Mary! Those little guys are adorable! The one on the left reminds me of a Herman Munster weeble! Okay...this just made me chuckle! STICKIN' CUTE! Thanks for joining us this week in the Create with Connie and Mary Thursday Challenge! Oh, this is SO cute, especially the Frankenstein! Thanks for playing along with the color challenge on Create with Connie and Mary! Love your little punched critters! They look great "stuck" in the spider web. Thanks for playing the Create with Connie & Mary Challenge this week!